HOME PRODUCTS &AMP; SERVICES DIRECTORY OF SUPPLIERS INTERACT POWER, INC. Interact Power's design team has extensive experience in providing solutions that fulfill our OEM customers goals for reliability, speed to market and cost effectiveness. Time to market is a critical element to the decision making process when selecting products and suppliers. Interact Power is poised to meet your requirements for expedited new product development and final production schedules. Our "Customer First" Program has enable Interact Power to establish the industry's shortest product cycle times. Interact Power designs and manufactures custom Power Products that meet your specifications and fulfill agency requirements. Please contact us for customized design options, ruggedized PDU's, Commercial-Off-The-Shelf (COTS) units and other options. Interact Power offers a wide selection of standard rack-mount single-input and redundant AC PDUs including 1U single and three-phase AC PDUs. Also available are 1U, DC to DC Power Distribution Units, which are fused and circuit breaker protected and controlled. 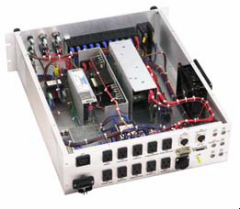 Additionally, Rack-mount Power Supplies are available in various sizes and Watts/VA. View More Product Announcements from Interact Power, Inc.